The intent is clear -- Germany want to become the first team for 56 years to retain the World Cup. "We want to write history," says Real Madrid midfielder Toni Kroos. Their buildup was dogged by the controversy surrounding Ozil and Gundogan after the midfielders, who have Turkish roots, were booed in pre-World Cup friendlies for meeting Turkish President Recep Tayyip Erdogan. German fans took a dim view of the perceived divided loyalty by booing the pair in a friendly defeat to Austria. During the flight, their stars visited the cockpit - Mats Hummels watched over the pilot's shoulder while Jerome Boateng and Marco Reus posed for selfies. Their nervy 2-1 win over Saudi Arabia last Friday is now in the past. 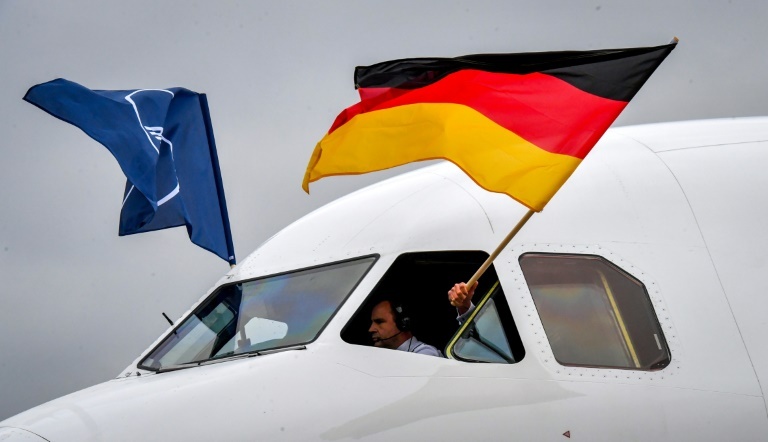 Germany's forward Marco Reus (L) jokes with Germany's midfielder Julian Draxler (R) as the German national football team board their plane for Moscow to take part in the 2018 FIFA World Cup in Russiaon June 12, 2018 at their departure from Frankfurt international airport.